State College Area High School is the only public secondary school in the State College Area School District. Located within walking distance of Penn State University, the school is known for its academic, athletic, and musical prominence. 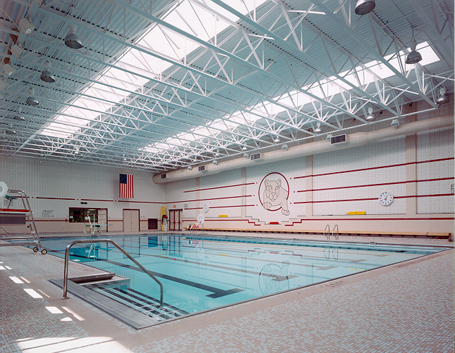 In 1988, the team of Breslin Ridyard Fadero Architects and Counsilman-Hunsaker were retained to design the natatorium with a NFSH pool, which has an average usage of 300 people per day. The pool is the venue for a variety of curriculum activities, intramural programs, interscholastic events and fitness opportunities. The natatorium’s pool is 75 ft. long by 45 ft. wide. The minimum depth is 3 ft. 6 in. and the maximum depth is 12 ft. 6 in. The pool is equipped with a large bleacher area for spectators and two locker rooms. The facility offers activities such as: physical education classes for grades 3, 4, 7, 9, 11 and 12, a varsity swimming and diving teams, USA age group teams, faculty, staff and student open lap swim, public swimming lessons conducted by Centre Region Parks and Recreation, Aquatic Certification classes (WSI and Lifeguard Training), aquatic cross-training for sports teams and school group rentals.